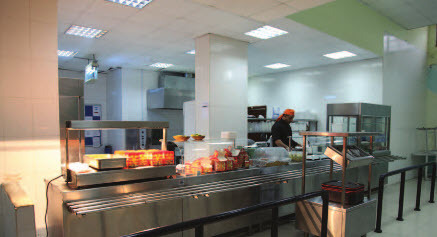 The cafeteria is open to accommodate all students depending on their break time. The students spend their lunch break together catching up and discussing common interests. The cafeteria conforms to the highest sanitary standards. The students have the option to bring their lunch from home or buy from the cafeteria at minimal cost. Salads, sandwiches, juices and other snacks are available every day for purchase. The IIS prayer hall is one of the most peaceful and reverent areas within the school. Students visit the prayer hall during their lunch breaks or before going home to pray and assure they never miss a prayer. Teachers pray together with students during specific hours of a day in the hall. The hall also contains a mini library enriched with religious books, texts and journals. Washing and wudu’ partitions are available to ease the process for students, teachers and staff. After school activities include Quran readings, memorizations, discussions and learning about religion through stories and literature.